Stag Do | Journey to "i do"
Last week, I said I’d recap Mr. Sword’s bachelor/stag party but it’s going to be a bit difficult because HE FORGOT TO TAKE PICTURES. Clearly, he’s not meant to be a blogger like myself. I did manage to steal one photo from Facebook, and luckily, it’s a tame one. 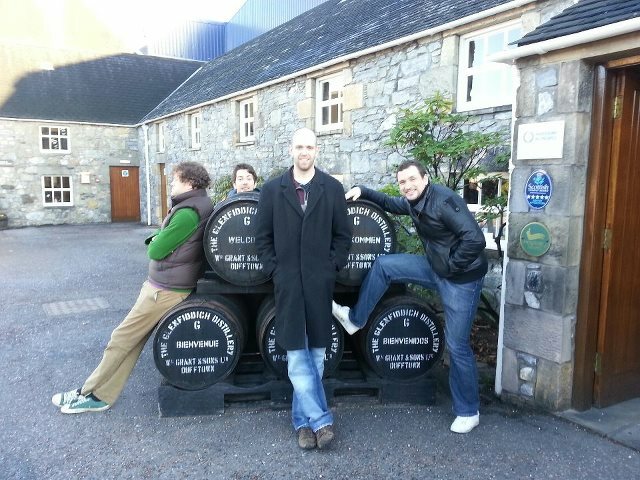 This was taken at a Whiskey distillery in Keith, Scotland. The story goes that not everyone was feeling well enough to go on the tour the next morning. Hehe. And keeping with my theme, here are some Stag Do(s) and Don’ts! DO rent a chalet (house) in the middle of nowhere to ensure one rockin’ good time. DON’T be afraid to invite over everyone in the bar to your rented chalet to party until the wee hours of the morning. Mr. Sword said that everyone in Keith is insanely nice and were really fun. I say, inviting strangers over to my house (rented or not) is the last thing I’d ever do! Clearly, I’m not very friendly though. DO take lots of shots and play lots of snooker. (Snooker = pool table.) Mr. Sword said he didn’t get sick even though he drank in excess and stayed up all night. It’s gotta be that Scottish blood. I felt sick hearing about the amount of liquor he ingested. DON’T forget to thank your awesome Best Man for throwing one hell of a Stag party! (For the record, Mr. Sword didn’t forget and got him a personalized cigar holder.) Best Man Doc has a PhD (hence his nickname), and has been an awesome friend to Mr. Sword for many years. In fact, all of Mr. Sword’s buddies back home are really great guys and I’m excited to party with them in Minnesota in a few short months! Is it March yet?? When I told my future father-in-law that I’m excited both Mr. Sword and I have such great memories from our parties, he replied with, “Yes, but I think Mr. Sword’s memories are a bit fuzzier than yours.” HAHA. So true. Miss Sword Wedding Tip: I recommend scheduling your stag/hen parties for the same weekend if you can, it’s nice to be busy with your friends while they’re busy with theirs, plus then you get to share that special weekend with your partner even if you’re not physically with them! Do you know what happened at your partner’s bachelor/bachelorette party? Did anyone else’s guy go away for a long weekend? Who wants to party in Keith now?